The top-of-the-range Ionos gets Giro’s new Roc Loc 5 fit system for 2011 which, unlike previous incarnations, comes with a ratcheting, micro-adjustable dial to make on-the-fly fine-tuning easier. With Roc Loc 4 you had two little buttons around the back that you either pushed closer together or pulled further apart when you want to alter the fit. You could tighten it one-handed simply enough, but loosening it was really a two-handed job. The Roc Loc 5 system’s dial is small – about 18mm in diameter – but it’s easy to adjust in either direction, even with gloved fingers, and a healthy click lets you know you’re turning it. The vertical fit – the amount the harness extends down the back of your head – is also improved. Whereas previously you had to take the helmet off to alter this, with Roc Loc 5 you can do it while it’s on your head. It’s a small point – you’ll probably never change this setting once you have it right – but it makes life slightly easier to begin with. You get three different vertical fit positions with a total range of 15mm. 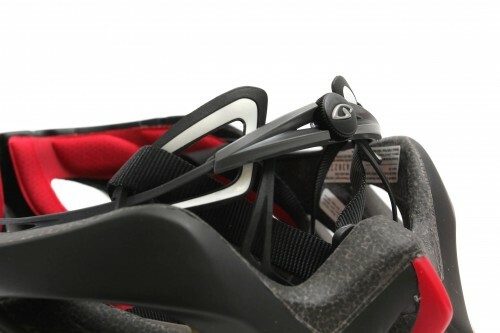 The other change with Roc Loc 5 is that the helmet straps thread through the arms of the fit system, holding them just that little bit more securely next to your head. We wouldn’t say that the Roc Loc 5 offers an improved feel over Roc Loc 4 – we found it perfectly comfortable and snug fitting before. But it is certainly much easier to tweak, lighter (by 40%), and, according to Giro, stronger. Speaking of weight, hitting the scales at 304g (medium), the Ionos isn’t the lightest helmet out there by a long way. 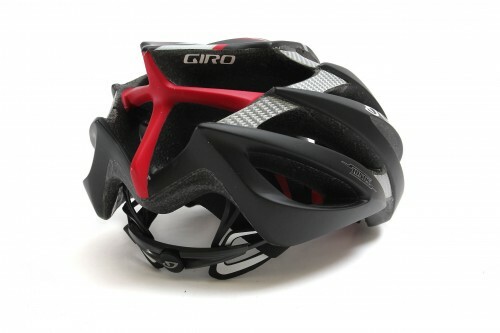 The super-light Giro Prolight (medium, £149.99), for example, comes in at just 174g and there are plenty of helmets in the 200-250g range. But where the Ionos really scores is in terms of comfort. You get excellent airflow here thanks to a whole load of vents (21, if we’re counting, although the figure isn’t really the point) including some large ports over the front and top sections. The internal channels are excellent, taking the air through so you don’t overheat even when you’re riding hard on a hot day. Your head really does stay noticeably cooler than in most other helmets – we’d say it’s the coolest lid we’ve ever used. The flip side is that you get a colder head in chilly temperatures, so you might find yourself digging out a skullcap a little more often than usual if you use this helmet. 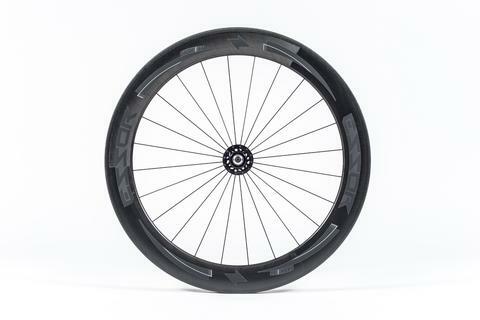 Giro are able to build the Ionos with such large vents because of what they call the in-mold composite sub-frame. That’s a posh way of saying that it has carbon fibre reinforcement running through it – you can see the silver-weave around some of the vents. This allows them to remove material and still retain the safety characteristics you need. Of course, the Ionos meets CE EN1078, the European safety standard. Finally, the Ionos comes with X-Static helmet padding that includes anti-microbial silver fibres. The idea is that it inhibits the growth of micro-organisms and so reduces odours. It’s also said to have thermodynamic benefits, keeping you cooler in summer and warmer in winter. Does it work? Pfft! We don’t know, to be honest. If it does, it’s too subtle for us to notice. What we do know is that the pads are comfy enough and they’re easy to take out and wash when you need to, and that’s all we really care about on that front. We’d always advise you to try a helmet on before you buy – or at least one from the same manufacturer. It’s got to sit right if it’s going to protect your swede. That said, most of the people we got to try the Ionos were happy with the fit. It comes in three different sizes and the retention system offers enough adjustment for a wide range of head sizes. Who should buy the Ionos? Well, if you’re after pure value for money, this clearly isn’t the choice for you. You don’t need us to point out that £169.99 (£159.99 with Roc Loc 4) is a helluva lot of cash to spend on a road helmet when you can get a similar level of protection for a fraction of the price. No, the main reason you’d buy the Ionos is for the high standard of venting and you’re going to benefit most from that if you’re a performance rider – a racer, sportive rider, or just someone who likes to go out and cycle hard. If staying cool is vital and you don’t mind paying big bucks, it’s an excellent choice. Several other helmets in the Giro range will have the Roc Loc 5 system for 2011: on the road it’s the Atmos (£129.99), Saros (£89.99) and Monza (£74.99). The Advantage time trial helmet (£139.99, size large only) gets it too, as do the Athlon (£99.99) and Hex (£74.99) mountain bike helmets, along with the new all-mountain Xar (£114.99). Better? It depends what you're after. The Prolight is lighter, the Ionos has better ventilation, so it depends on your priority. It's not a massive difference in ventilation – but you will notice it. You'll notice it more, mind, if you ride a big Pyrenean climb in July rather than typical UK conditions. A weight difference of 130g is tiny. It's not going to make you go any faster or slower. It's just that you might find a lighter lid a bit more comfortable. Personally, I do. The other thing to think about is the fit system - with the Ionos you can fine-tune it lots, with the Prolight you pretty much get what you're given. We don't know anyone who has had any trouble with the Prolight's fit but the only way to check for sure is to stick one on. Cheers Mat. Yep essentially the Prolight and the Ionos are completely different helmets, weight being the empahsis on the Prolight design brief (172g - medium) whilst ventilation was the number one priority for the Ionos. To help account for the weight difference between to two - the larger the vents (Ionos) then the meatier the supporting framework has to be (in order for it to pass the same safety standards, etc). It might also be worth noting that all production Ionos helmets come with a winter kit included (they're that well vented), the pre-production item Mat tested unfortuantley didn't come through with one. I think that it is rather telling that a visual "poll" of this years Tour riders sponsored by Giro it appeared (IMHO) that the majority wore the Ionos rather than Prolight. Contador (and possibly Menchov) being the only one that I can think of. Noticeably LA and a lot of others seemed to be wearing Ionos. Personally a cool helmet is more important than a very light helmet. Its in the post and I eeees very happy.